Drones have no doubt opened a world of possibilities for carrying out some amazing and useful tasks. These versatile, pilotless flying machines have proved their usefulness in areas such as aerial photography, surveillance, and law enforcement. And their potential for the future is nearly limitless. But the proliferation of the technology also poses a series of threats. 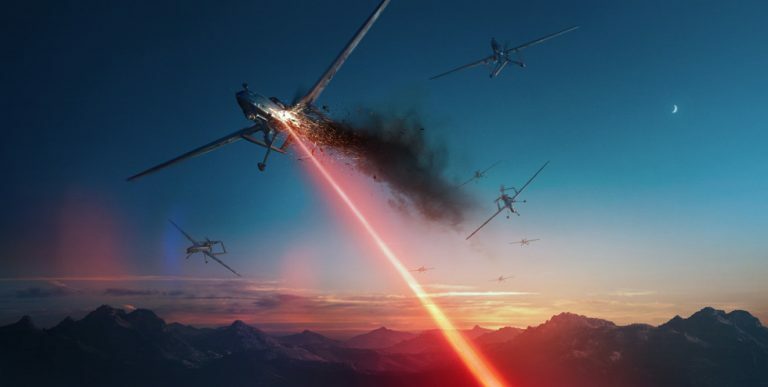 To cope with these threats, Lockheed Martin, in conjunction with the U.S. Army’s Space and Missile Defense Command, is developing a new laser weapon system. Footage of testing has revealed how ATHENA (Advanced Test High Energy Asset) can deliver an invisible killing blow to unmanned aerial vehicle threats. Tests were conducted at the Army’s White Sands Missile Range in New Mexico. In the video, a 30-kilowatt-class ATHENA system brought down five 10.8-ft.-wingspan Outlaw drones. The ATHENA system is powered by a Rolls-Royce turbogenerator and is still considered a prototype. In the future, the ATHENA laser could prove to be very helpful in protecting soldiers from threats, such as swarms of drones or large numbers of rockets and mortars. In comparison to alternative weapons, the ATHENA laser offers greater speed, flexibility, precision, and lower cost per engagement.